5. Website traced to Marina del Rey, USA.
" Dear Washington Mutual customer, We recently reviewed your account, and we suspect an unauthorized ATM "
We recently reviewed your account, and we suspect an unauthorized ATM and/or PIN- based point of sale transaction on your account. Protecting your account is our primary concern.Therefore, as a preventive measure we have temporary limited your access to your sensitive information. Washington Mutual Bank features.To ensure that your account is not compromised, simply hit "CLICK ON THE REFERENCE LINK" to confirmyour identity as a card member of Washington Mutual Bank. 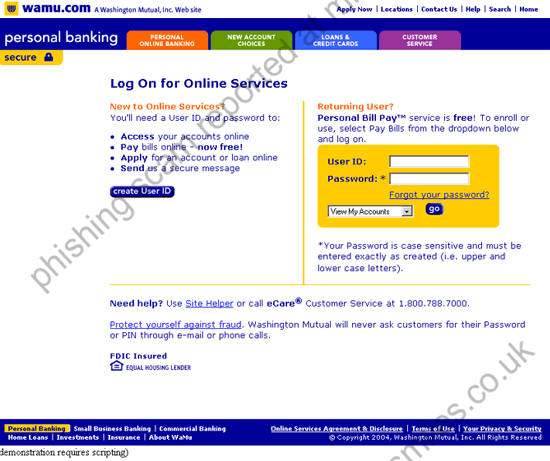 Login to your Washington Mutual Online Banking with your username and password. Confirm your identity as a card memeber of Washington Mutual. View your transaction history and report suspicious activity or any unauthorized change. If you are not enrolled for Washington Mutual Online Banking get started today! Complete the steps below and take advantage of our online services today! Select your account: Personal Accounts, Small Business Acounts, Commercial Accounts. *For assistance, log to your Washington Mutual Account and chose the "Help" link in the header of any page.